Barrett Brown. Source: Wikimedia Commons. Could still get decades in prison. United States prosecutors today said they have dropped eleven charges against journalist Barrett Brown - including for publishing a hyperlink in an online chat forum - in one of the closest watched digital liberties trials yet. The US government had accused Brown of publishing a link to a file in an Internet Relay Chat room, which allegedly contained credit card validation information for 60,000 clients of security contractor Stratfor, which was hacked in 2011. Brown's lawyers had argued [PDF] for a dismissal of the hyperlinking charges, saying it did not amount to an actual transfer of the file and therefore, could not be construed as a crime. Hyperlinking was also protected speech, Brown's lawyers said, and covered by the First Amendment to the United States Constitution which permits freedom of expression. 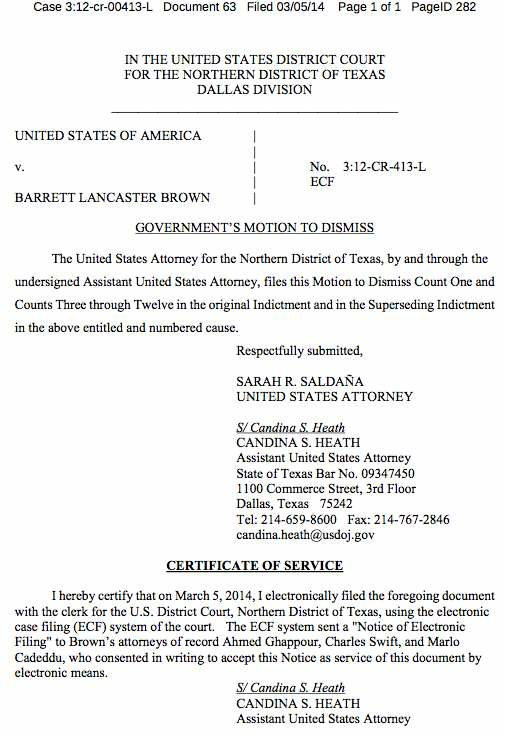 Soon after the motion to dismiss the hyperlinking charges was filed by Brown's lawyers, US prosecutors responded and dropped the allegations along with ten others linked to it. The dropped charges represent a substantial victory for Brown, reducing a possible century-long prison sentence by decades should he be found guilty. Brown faces further charges on alleged threats against police and obstruction of justice. He was arrested in September 2012 and has been in custody since then. In November last year, hacktivist Jeremy Hammond was handed a ten-year prison sentence for his role in the Stratfor hack.